name 5 things. : Riley + Headbands = Cuteness. Riley recently had a growth on the side of his neck that ended up getting inflamed and had to be removed. Everything is fine now and it's not cancerous, so there shouldn't be anything that we need to worry about. Because he's ok, I don't feel so bad embarrassing him. We had to wrap up the spot for a few days before the vet removed it. One thing is for sure, Riley sure knows how to rock a headband. I swear this wrap looked red at Petco, but once I got it home, it was definitely more raspberry than red. Hopefully Riley didn't mind too much. I still think he looks super cute. He would occasionally paw at the wrap, and a couple times he ended up pulling the band in front of his ears over his eyes. We tried so hard not to laugh at him, but it was pretty darn funny when he was trying to walk around without being able to see. I always felt so bad for him when it happened, I never had the heart to take a picture of it. Once we ran out of the pink raspberry wrap, we went to Petsmart to see if they had more manly colors. Thankfully, they had some blue. See how much happier he looks? And last up -- yellow, which is what the vet's office had. His face is so sweet! And I love it when his ears flop back when he looks up. 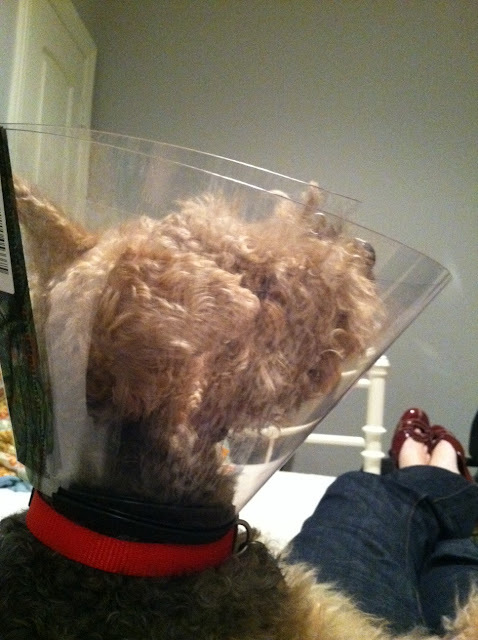 And one of the best looks, the cone after the surgery! Thankfully, he just got his stitches out and doesn't have to wear the cone anymore. Am I a mean pet parent for exploiting Riley on the blog? :) The "headbands" were just too cute not to share! Ha ha - no you're not mean :) This is hilarious! I put reindeer antlers on mine one year - it was priceless - reminded me of the Grinch's dog- ha! Those cones are always funny aren't they?! such sweet puppies! and doggies in cones are hilar! so glad he's going to be okay! so sweet. it's hard not to chuckle at their behalf sometimes. i am sure they laugh at us when we look/act ridiculous too. we just can't tell. glad R's a-ok! OMG you are awesome. First, I'm so happy to hear that the tumor was not cancerous and he will be OK. Second he rocks the head band better than any other dog i've seen!! love it. I swear Riley is the cutest thing ever! !